Safer: 4 wheels are more stable than 2 or 3 wheels. See Tom & Diane's story! Adjustable seats and independent 21-speed shifters make both riders happy. Choose from color options and many accessories to personalize your quadricycle. In fact, contact us to customize yours for a special use. We all know that staying healthy means exercise and fresh air. Settle into a VierBike and get lots of both! Enjoy a pleasant ride in the park, a quick spin into town for a cup of coffee, or a quiet cruise through your neighborhood. Comfortable, enjoyable, active—this is the wonder of VierBike. Who said being active has to be boring? Add spice to your daily routine with VierBike. From sharing your ride with a friend to turning the heads of passersby on the street, our bikes are loaded with fun. 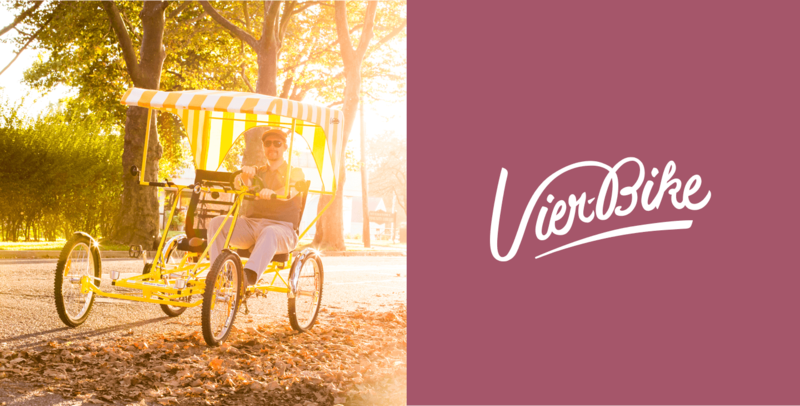 With a VierBike, you’ll want to be active! VierBike is a unique and appealing combination of active lifestyle, retro styling, and precision German engineering. Our sturdy four-wheeled bikes are built in the USA by fine craftsmen with German heritage using high quality custom and trusted name brand parts. Browse Bikes. What is a VierBike? Half car, half bike, VierBike is a pedal-powered quadracycle that offers a unique and practical way to cruise around in style. Unlike ordinary bicycles, our quadricycles feature four wheels and a sturdy steering wheel for superior operation, control and stability, making it perfect for both young and old alike. Instead of a narrow, hard bicycle seat, our quadracycles come standard with a wide seat and full back, ensuring comfort on every journey. When you own a Vierbike, you’ll actually want to spend more time outdoors, exercise, and stay active. And with a variety of styles and colors, you’ll be sure to find one that meets your needs and personality.